There’s really nothing like the experience of being out on the open water. I could try and argue that running into the deep woods is a fair comparison, but as I think about it with an objective mind, I’d have to confess that it’s not. In the woods, there is protection from the sun and other natural elements, and you’re never really in any danger of being deprived of life’s essentials. When you’re out on the water however, especially a large body of water where you could be very far from shore at any given point, much of that protection doesn’t exist, and there can be a sense that you’ll become stranded and not able to readily get help. All that being said, I took my first trip out onto the water in many years on Monday, October 31st, Halloween Day 2011. 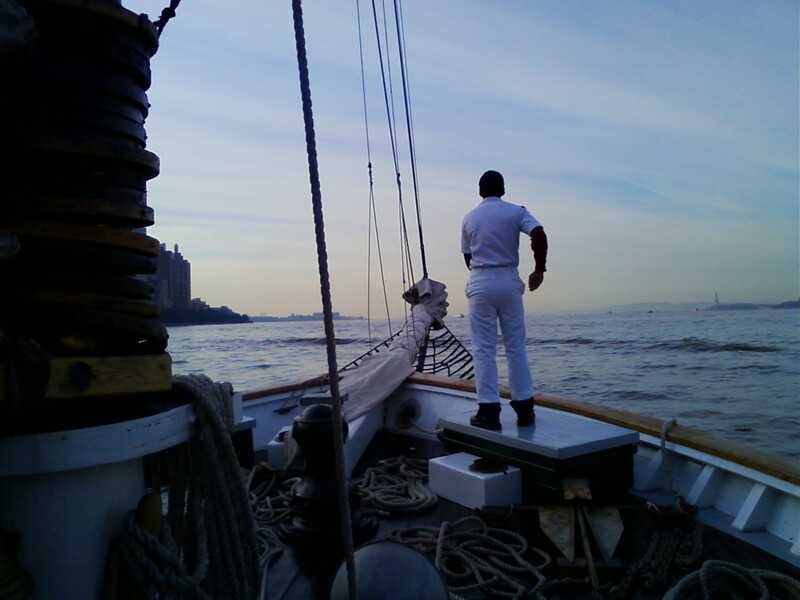 The occasion was a sail with the Hudson River Sloop Clearwater, and it was an experience that I can only describe as memorable. The owner of the sloop, the Clearwater organization (http://www.clearwater.org), is my charitable partner in the run that I am planning next Spring along the Hudson River to raise money in support of Clearwater’s ongoing operations and initiatives. In order for me to better understand what it is they do (and what it is I’m running for), they invited me to come out on the boat and see what they’re all about. I came away from the boat ride with an even greater sense of meaning for what it was I would be doing when I run the entire 315-mile length of the Hudson in May of 2012. 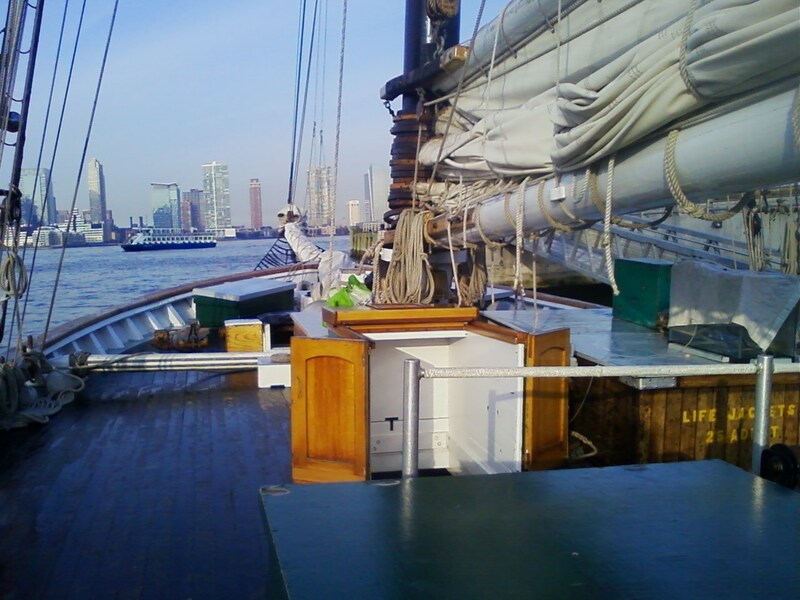 The Sloop spends April thru October of each year sailing up and down the river, with more than a dozen docking points from Albany all the way down river to lower Manhattan. The sails vary in nature and purpose, with some being what they call ‘public sails’ while others are either educational sails set up with youth groups, or in some cases, private charters. 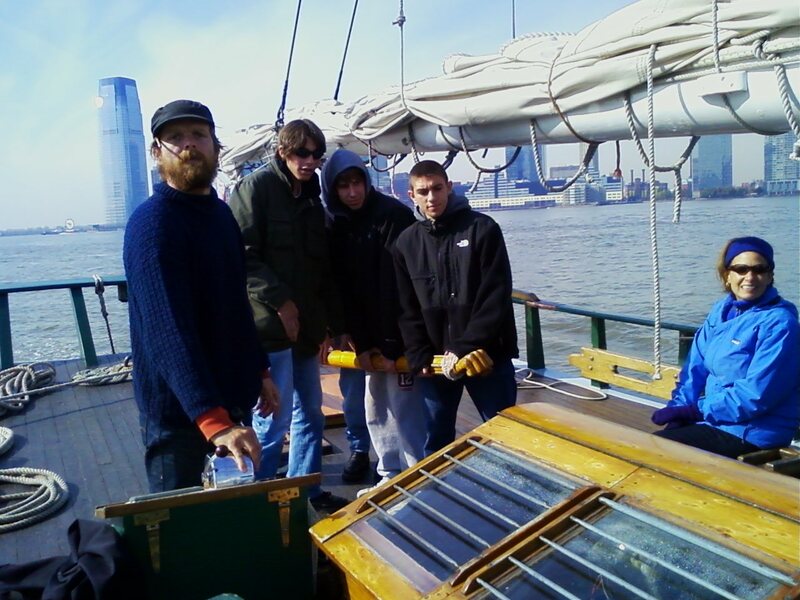 The public and educational sails have a purpose, and that is, to teach people about the river. As Pete Seeger – founder of Clearwater in 1966 – tells it, if people are given the chance to go out onto and experience the river, they’re more likely to protect it. This defines Clearwater’s goal quite well, which is to educate and empower the next generation of environmental leaders. 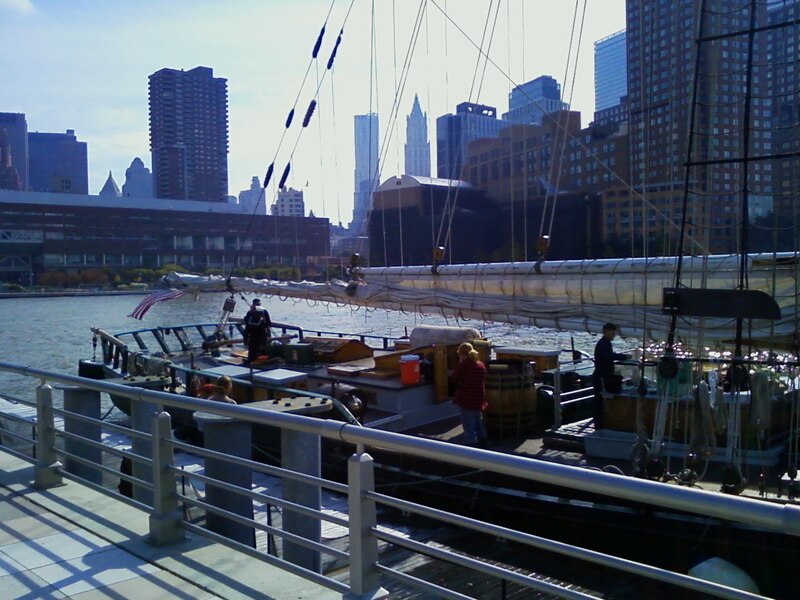 We set out from Pier 25 in Manhattan’s Tribeca neighborhood at a little after 9:00am. 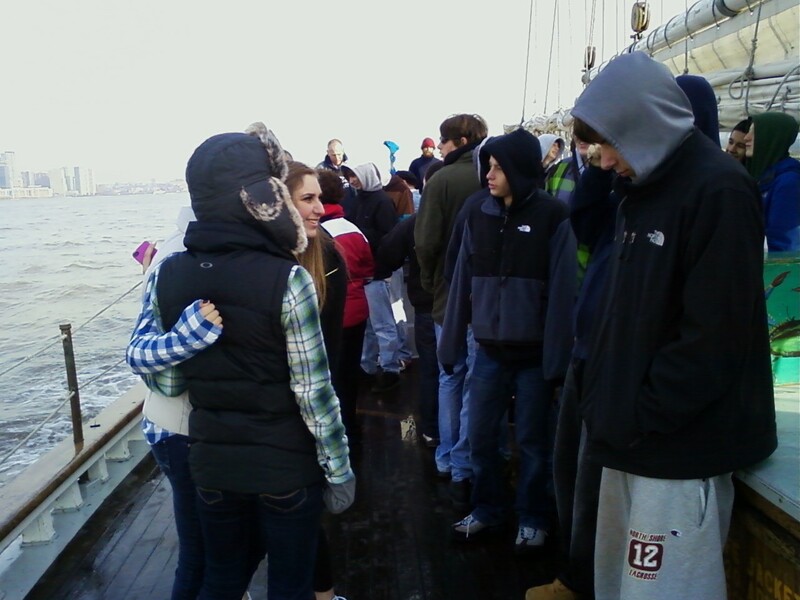 The primary passengers today were a group of high school seniors from North Shore High School on Long Island. The weather was a bit nippy, but the sun was shining brightly, setting the tone for a terrific morning on the water. We began the trip using the boat’s motor, which I must confess, surprised me a bit. I don’t know why I presumed the boat wouldn’t have a motor (a testimony to my ignorance), but I quickly realized that a sailboat without a motor would be a problem just waiting to happen. As we moved out into the river and turned south toward Upper New York Bay, I felt the frigid chill of the wind and was grateful I’d dressed appropriately. 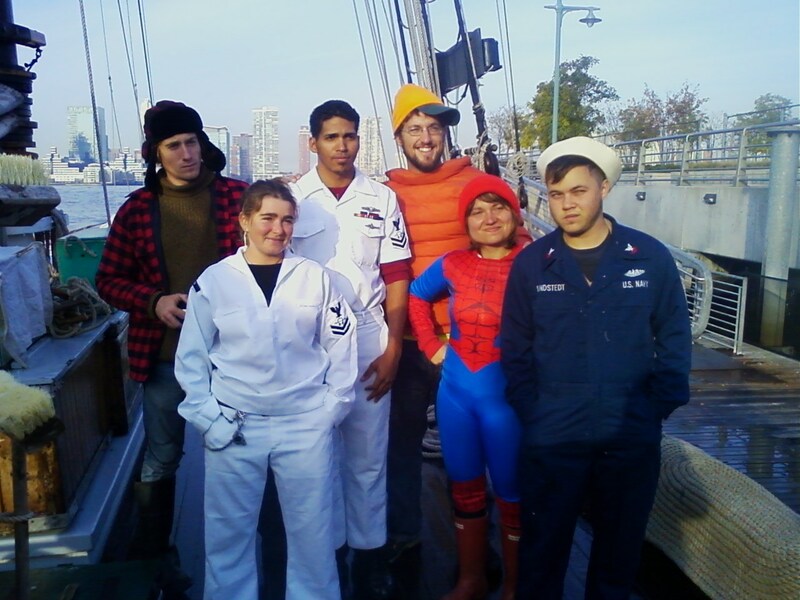 Some of the crew members appeared to be dressed quite scantily in respect to the temperature conditions, but when I heard one of them remark that they’d been lucky to have warmer weather the past couple of weeks, I felt quite the wimp for even thinking about being cold. 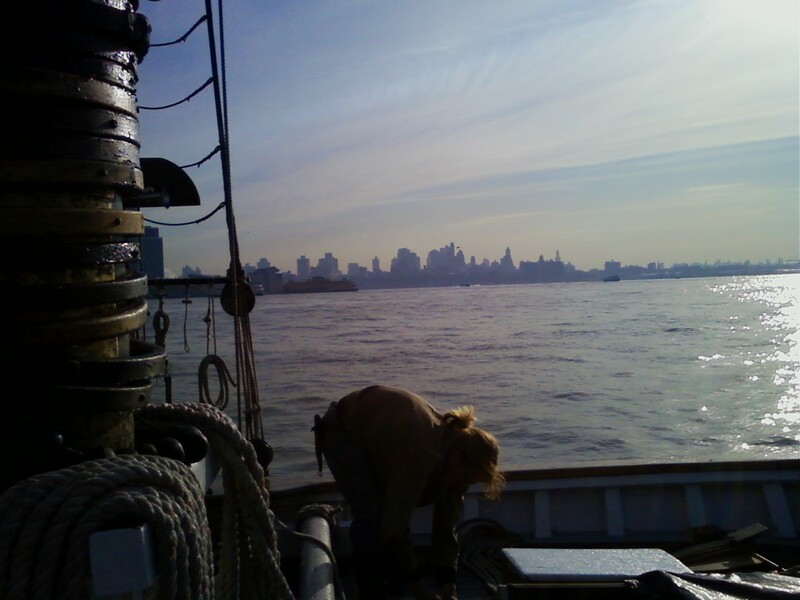 The sloop purred across the waves as we passed the splendid skyline of New York City’s recently maligned financial district, and then went on to skirt the shores of Governor’s Island – just a short ferry ride south of the city’s big island – before Captain Nick stopped the motors as we pulled even with Brooklyn’s Red Hook industrial riverfront. Our first activity of the day would be to fish. Two of the crew members stepped up in front of all the kids and described the process. Following the instructional segment, they put the kids to task, engaging a number of the somewhat reluctant Long Island seniors in the process of tossing the big fishing net into the water. After several minutes of trolling , the nets were brought back in with the catch of the day, which included many varieties of fish and crabs. All of today’s catch would eventually be returned to their home in the harbor, but many of the sea creatures were put into a temporary makeshift fish tank for the educational session that would follow a bit later. With the fishing portion of our trip done with, the next activity would be to raise the sails. 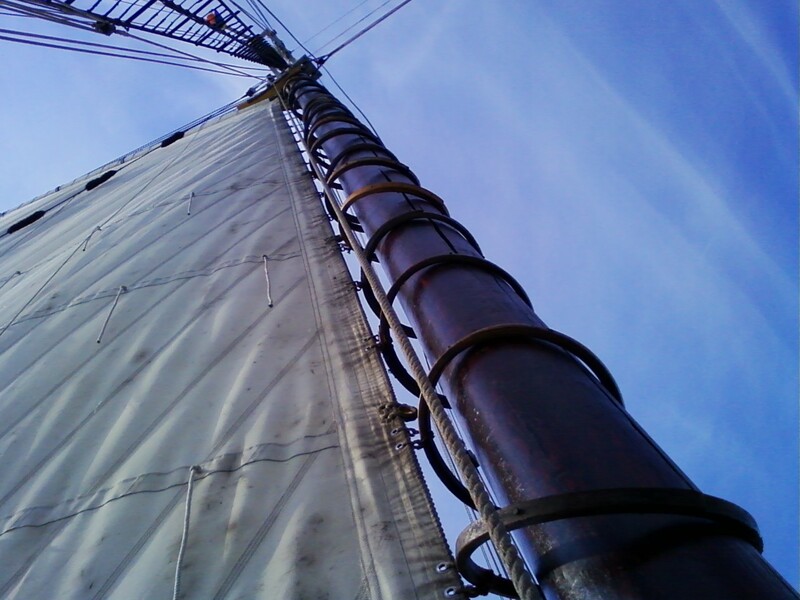 Never did I expect the raising of a ship’s sails to be so involved, but when you’re dealing with 3,000 lbs of weight and three pieces of sail material to hoist, it’s clearly a job, and not for those built like me (meaning of the chicken-armed variety). Separating the school kids into two groups, one on the port side and the other on the starboard side, the crew then directed them in the rigorous job of pulling the main sail up the mast, foot by foot and – as it neared the top – inch by inch. Upon completion of the task, huge sighs of relief could be heard amongst the students, and although I had been spared being involved in the effort, I was relieved in somewhat of a secondhand nature. With the sails in place, Nick proceeded to turn the boat around. 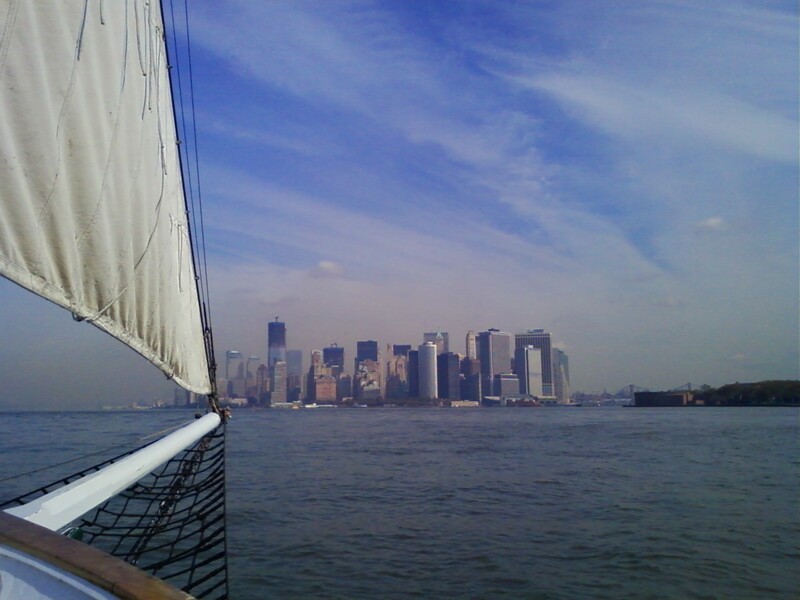 We‘d been facing the Verrazano Bridge, the two and a half mile long behemoth that spans the Verrazano Narrows (which separates Upper and Lower New York Bay), but we would sail in the northward direction, giving us a spectacular view of lower Manhattan as we headed back toward Pier 25. As the sail began, the crew split the kids into four groups and placed them into educational stations in each corner of the sloop. One group looked at and discussed the fish that had been caught earlier, another studied the various ropes, and a third reviewed maps of New York Bay and talked about some of th e history of the river in this region. I can’t for the life of me remember what the fourth group was about, but some of the kids were gathered with Nick as he managed the ship’s rudder. The handle of the rudder is a fitting piece of artwork for such a majestic water craft as the Sloop: a hand-carved, clenched fist, emblematic of strength and courage, and harking back to the days of yore when seafarers faced the danger of not always knowing what lay ahead in their journey. As we approached The Battery the skyline was a sight to behold, and all I could think of was how amazing it was going to be when I ran the final few miles of the Hudson River Run next May, seeing the buildings of the financial district and the 1,776-foot tall One World Trade Center building (still under construction, and scheduled to open in late 2013) waving me toward the finish line. From the bow, I could see the building at 55 Water Street, headquarters of Standard & Poors, where my girlfriend Catherine has worked since the summer. For a moment I recalled the article I had once read about the peregrine falcons that nest on one of the building’s ledges each Spring. 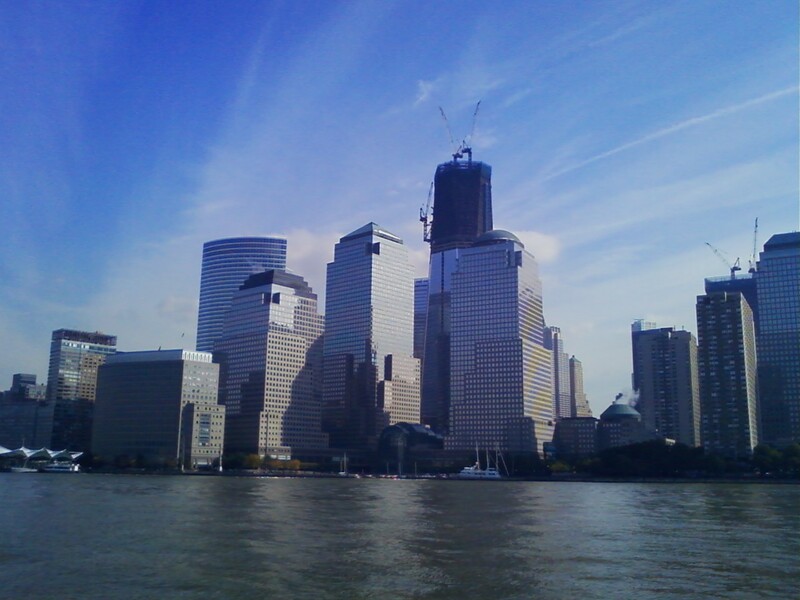 But the one thing that filled my soul the most as we rounded the island and sailed past the World Financial Center was the liberating feeling of being out on the open water. Earlier in the sail, one of the crew members had told me that she’d lived her whole life on the water, and couldn’t imagine any other way of living. As a boy from Central New York who favors mountain trails over ship lanes, I didn’t share her perspective, but I can say without the slightest bit of hesitation that I understood exactly what she meant. The sail came to a conclusion, and when the boat was successfully repositioned in its berth at the pier, I smiled and reflected peacefully on this grand experience. When I stepped off the boat and onto the pier, it was with a bit of melancholy. I could very easily have been persuaded to remain on the boat all day, pulling up sails, tying off ropes, swabbing the deck, or whatever needed to be done. As I walked away and back toward the street, I waved goodbye to the Sloop, at least for now. 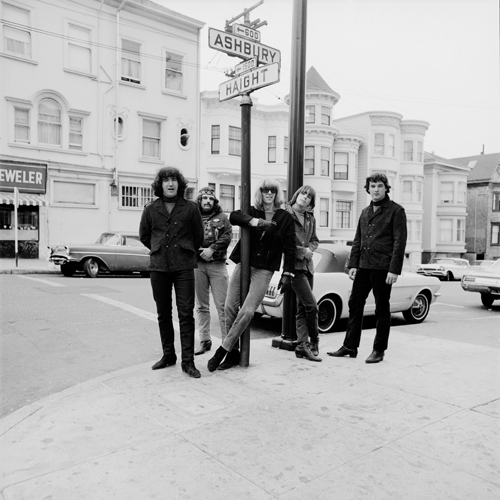 I knew that she and I would see each other again in the Spring, and that was a nice thought. Despite the feeling of melancholy, I felt so energized that I took it upon myself to walk all the way from Tribeca to Catherine’s apartment at 72nd and 1st on the Upper East Side, approximately 5 miles. It was the kind of morning that deserved a long walk to reflect and appreciate the beauty of it all, and perhaps due to all of my excitement, upon arriving home it hardly felt like I had walked a step. This entry was posted in Running and tagged Battery Park, Governor's Island, Hudson River, Hudson River Sloop Clearwater, New York City, North Shore High School, Pete Seeger, Tribeca, Verrazano Bridge. Bookmark the permalink.